§ 187-90.1 Transfer of development rights. § 187-90.2 Adequate public facilities. 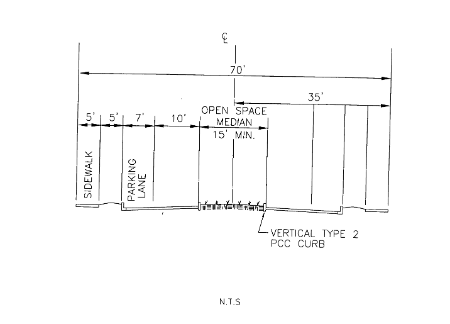 § 187-90.3 Conversion of existing single-family condominium to fee-simple single-family subdivision. § 187-90.4 Stormwater maintenance districts. This ordinance also provided that it shall be reviewed by the Levy Court two years from the effective date to evaluate its success and whether the results of implementation are consistent with its stated purpose and intent. Ensure that development rights may be transferred to properties that are in areas or districts that have adequate support facilities, including, but not limited to, transportation, water, sewer, education, employment, recreation, and commercial services to accommodate additional development. The rights of the owner of a parcel of land to develop or use the parcel in accordance with Chapters 205 and 187 of the Kent County Code. A retail complex of three or more retail establishments designed, developed, and operated with accessory off-street parking located on the premises to serve jointly all establishments in the complex, and offering goods and services to primarily meet the everyday needs of residents of the immediate vicinity. One or more designated districts within which the development rights from sending districts may be transferred into for use within development projects. A parcel of land in a receiving area that is the recipient of transferred development rights from a parcel located in a sending area for the purpose of development with an increase in the number of dwelling units equivalent to the number of transferred development rights in addition to the number of dwelling units that would otherwise be permitted on the parcel. One or more districts in which the development rights of parcels in the district may be transferred from for use in one or more receiving districts. A parcel of land in a sending area from which development rights are being transferred for use on a parcel within a designated receiving area, and upon which a legally binding and irrevocable preservation easement has been placed and recorded that would prohibit the future development of such parcel to the degree commensurate with and equivalent to the number of development credits that have been transferred from the parcel. The procedure prescribed by this section whereby the owner of a parcel in the sending area may convey development rights in perpetuity to the owner of a parcel in the receiving area, whereby the development rights so conveyed are extinguished in perpetuity on the sending parcel and may be exercised on the receiving parcel in addition to the development rights already existing regarding the parcel. A system of transferable development rights credit for properties situated within designated sending area is established in Subsection D, Sending areas, below. A system of limitations on the quantity of development rights credits that may be imported into designated receiving areas is established in Subsection E, Receiving areas, below. The designation, tabulation, tracking, recordkeeping, management and transfer of development rights shall be under the direction of the Kent County Department of Planning Services in accordance with the provisions of this section, and procedures established by the Department of Planning Services. All sending parcels shall be encumbered in perpetuity by an irrevocable preservation easement prepared by, and at the expense of the buyer, the seller, or both, of the development rights. Such preservation easement shall be recorded and become a codicil to the property deed of the sending parcel, and shall have the effect of limiting in perpetuity the future construction of dwellings on the sending parcel to a maximum number equivalent to the total number of dwelling units permitted by right in the Zoning District in which the sending property resides for the entire sending parcel, minus the total dwelling unit credits transferred from the parcel. All properties to which development rights are planned to be transferred shall comply with the provisions of Subsection E, Receiving areas, of this section and shall be subject to the plan review and approval processes set forth in Subsection K, Review process, of this section. All areas outside of the Growth Zone Overlay as adopted by the Levy Court shall be considered sending areas. Such petitions shall be subject to public hearing before the Regional Planning Commission and the Levy Court. The Regional Planning Commission shall formulate a recommendation to the Levy Court who shall make the final determination. Lands adjoining east side of State Route 1. Editor's Note: Attachment A is on file in the County offices. Primary sending areas: 1.5 dwelling unit credits per acre preserved. Secondary sending areas: 1.0 dwelling unit credits per acre preserved. Tertiary sending areas: 0.5 dwelling unit credits per acre preserved. Net developable acreage. Lands that shall not be subdivided according to Chapter 187, Subdivision and Land Development, of the Kent County Code, such as ponds, floodplain, and wetlands, shall not be included in the calculation of transferable development rights. In order to determine the net developable acreage for the site, the National Wetland Inventory Maps and the FEMA Flood Insurance Rate Maps may be used to estimate the acreage dedicated to wetlands and floodplain. The Department of Planning Services shall provide such estimates. In lieu of utilizing map data from the National Wetland Inventory Map and the FEMA Flood Insurance Rate Map, the applicant may, at his or her expense, have field analyses performed and certified by the United States Army Corps of Engineers in the case of wetland delineations, and FEMA in the case of floodplain delineations and base flood elevation determination, for purposes of determination of net developable acreage. Sending parcels may convey some or all of their total available transfer credits as verified by the Department of Planning Services in accordance with Subsection F below. Lands for which the State of Delaware, or any other entity, such as the federal government, a nature conservancy, or any other nongovernmental agency, has purchased or otherwise secured the development rights, either through fee simple acquisition, condemnation, eminent domain, deed restriction, easement or any other legal means for the expressed purpose of preventing the development of such lands, shall be ineligible for participation in the Kent County Transfer of Development Rights Program. Examples of such lands include any state or federal owned property and lands on which agricultural preservation easements have been purchased. Property owners who have transferred development rights from their land forfeit the ability to use the land for any purpose or use other than those permitted by right in the underlying zoning district; except that such property shall not be subdivided for residential development. Properties from which a specific quantity of development rights has been transferred shall have forfeited, in perpetuity, the right to subdivide or develop that specific quantity of development units on the sending parcel. Specific areas inside the Growth Zone Overlay have been designated as receiving areas for transferred development rights. Adjacency to municipalities (inside the established Growth Zone Overlay). Editor's Note: Attachment B is on file in the County offices. Municipal receiving areas. Areas within municipal boundaries may also be considered for designation as receiving areas if a municipality chooses to participate in the Kent County Transfer of Development Rights Program. The participation of municipalities may be arranged through memorandum of understanding between the municipality and the Kent County Levy Court. Participating jurisdictions shall be responsible for designating specific receiving parcels within their jurisdiction and for establishing design criteria and approval processes in substantial conformance with the County's criteria for development projects utilizing transferred development credits as specified in Subsections G, H, I, and J below. Primary receiving areas: seven dwelling units per acre. Secondary receiving area: five dwelling units per acre. County approval of development transfer credit calculations. Total development credits available for transfer from any given parcel shall be verified and approved by the Kent County Department of Planning Services in a form acceptable to Kent County. Requests for verification and approval of development credit calculations shall be submitted to the Department of Planning Services for consideration on application forms prepared by Kent County. Such application forms shall be signed by the owner or owners of record of the subject property. Completed application form and applicable fee. Certification of transfer credits. Upon verification and approval of the total development credits available for transfer from a given sending parcel, the Department of Planning Services shall issue to the owner of record of such parcel, a certificate of transfer credits. The certificate of transfer credits document shall indicate the Tax Map identification number for the subject parcel, the name and address of the owner of record of the subject parcel, the absolute number of development credits available for transfer from the subject parcel, and a unique serial number of certification for the document. The certificate of transfer credits shall be the official statement of transfer credits per parcel for purposes of this section. List of certified transfer credits. Approved development credit calculation forms will be kept on file by the Department and available for public review. Preparation of irrevocable preservation easement. Prior to the issuance of verification and approval of a transfer credit calculation, the applicant shall cause to be prepared an irrevocable preservation easement for the purpose of establishing a perpetual restriction upon the sending area property from which development credits are being sold or transferred. The irrevocable preservation easement shall be prepared by, and at the expense of the buyer, the seller, or both, of the development rights, and shall be subject to review and approval of the Department of Planning Services. Recordation of irrevocable preservation easement. Such preservation easement shall be recorded in the Office of the Recorder of Deeds for Kent County at the time of sale of any development credits, and shall become a permanent, perpetual preservation easement on the deed of the sending property. No such preservation easement shall be recorded without the signature of the Director of Planning Services or designee. A one-family dwelling attached to two or more one-family dwellings by common vertical walls. No more than six dwelling units shall be in an attached group. A dwelling unit not attached to any other dwelling by any means and is surrounded by open space or yards. 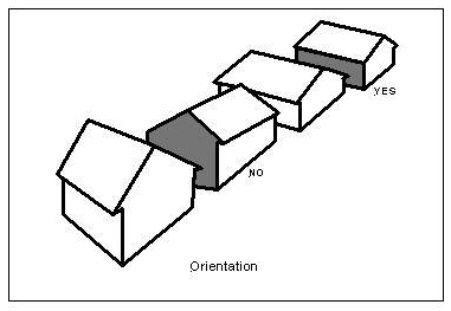 A one-family dwelling attached to one other one-family dwelling by at least a common roof system and a common vertical wall, with each dwelling located on a separate lot. For the purposes of this section, this term is synonymous with duplex. A building containing three or more dwelling units, including units that are located one over the other. A building containing three to five dwelling units that may separate individual dwelling units within the building by partition wall or by floor. 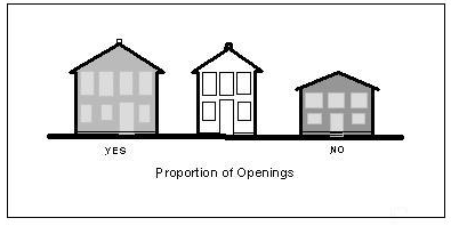 Diversity of housing types - primary receiving area. Projects shall include a variety of housing types. At least 20% of the proposed units must be of two different dwelling types as defined in Subsection G(1) above. Differing housing types shall be integrated throughout the project, and shall not be segregated by housing type. 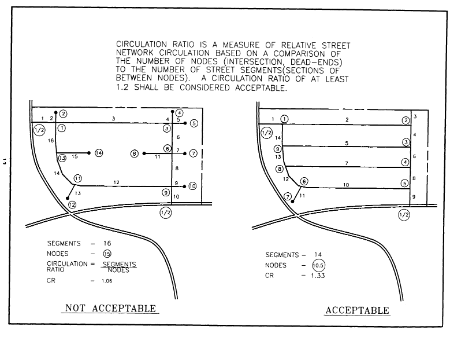 All plan submissions shall demonstrate that the proposed subdivision street system will achieve a circulation ratio of 1.2 or greater. If a subdivision is planned to be constructed in distinct development phases, then the plan shall demonstrate that the initial phase individually and in conjunction with all subsequent phases, will achieve and maintain the minimum circulation ratio requirement. 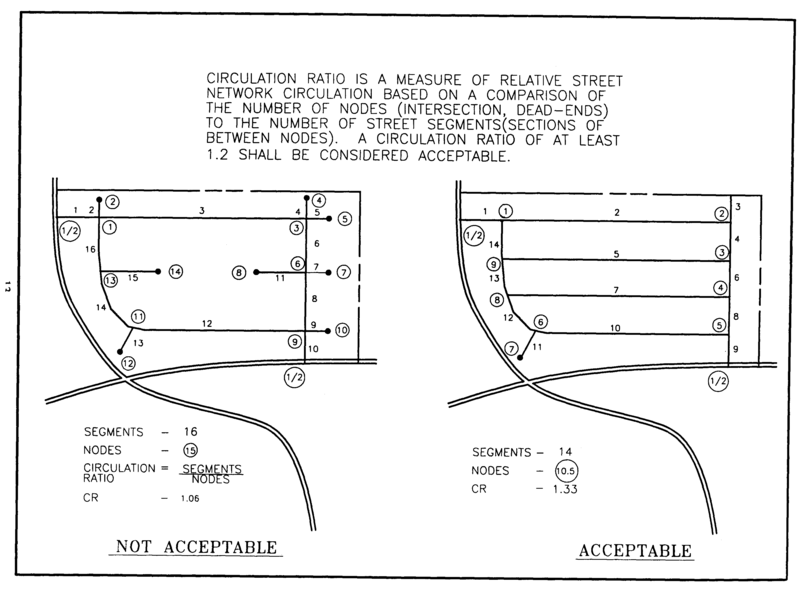 The circulation ratio is determined by dividing the number of street segments (street sections between intersections and/or cul-de-sac ends) by the number of intersections and cul-de-sac ends (nodes). For purposes of this calculation, proposed street intersections with existing roads and stub roads for future access to vacant developable lands shall count as 0.5 intersections. 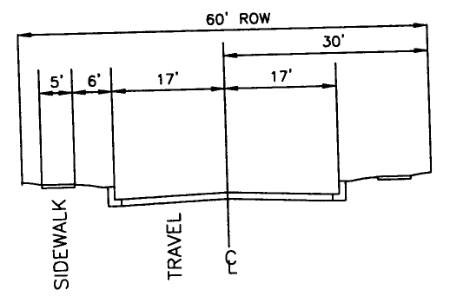 See Figure 187-90.1-A below. The Regional Planning Commission may waive the circulation ratio of 1.2 if the applicant can adequately demonstrate that due to a unique design or unusual site characteristics, the required ratio cannot be achieved. Local street: a street primarily used for access and service delivery to abutting properties. No more than 100 dwelling units shall front on a local street. Minor collector street: a street that serves as a frontage street to abutting properties and which conducts low volumes of traffic between local streets and major collector and/or arterial roadways. No more than 150 lots shall front on a minor collector street, and a minor collector street shall serve no more than 300 lots exclusive of other subdivision streets. Minor collector service. As an alternative to conventional collector street design, a boulevard street to serve as a minor collector subdivision street within a proposed development may be utilized. The boulevard street is an appropriate street type for the development being proposed. In an effort to accommodate local traffic, provide secondary access to rear lot lines, parking in the rear of buildings and service delivery, such as trash collection and utility service, alleys may be utilized. 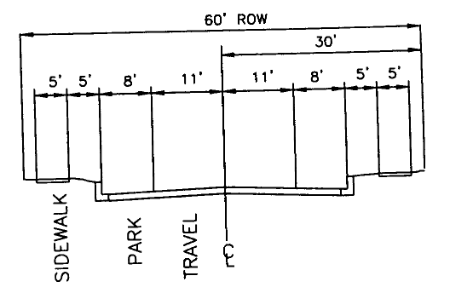 The right-of-way and pavement width of alleys as well as ownership and maintenance shall be in accordance with § 187-58 of the Subdivision and Land Development Chapter. Residential subdivisions and land developments shall provide sidewalks on both sides of all streets. The developer shall install sidewalks along arterial and collector roadway frontage of a property whenever such property is the subject of a subdivision or land development proposal that requires Regional Planning Commission or Levy Court approval. In nonresidential land developments sidewalks shall be constructed along private access roadways and site entrances to provide continuous pedestrian access from the required frontage sidewalk to existing and proposed buildings on the premises. Sidewalks shall be designed and situated so as to provide pedestrian linkages from parking lots to building entrances and between buildings and groups of buildings on the premises. Sidewalks shall be established at a minimum paved width of five feet. Sidewalks shall be separated from the edge of road, pavement, driveways, and site entrances by a grass strip or landscape area of at least three feet in width and preferably five feet in width. 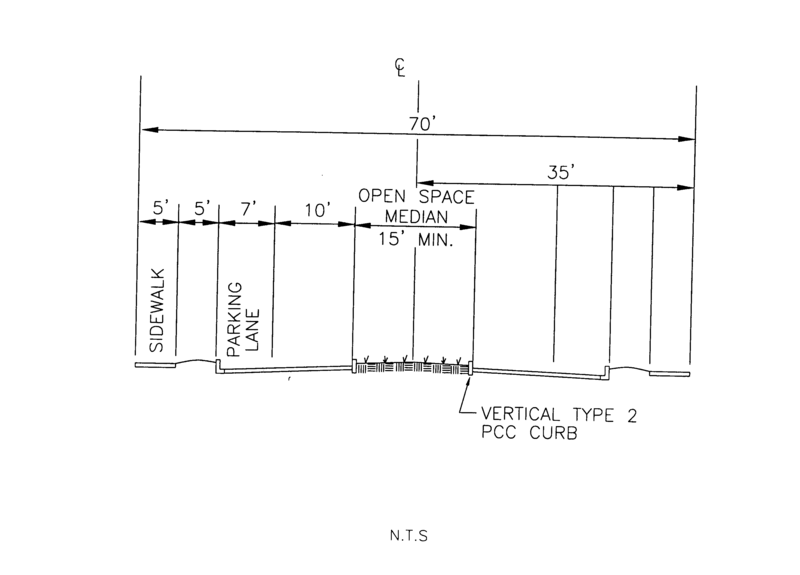 Where a sidewalk is planned to adjoin the pavement edge of parking lot areas, such sidewalk shall be grade separated from the parking lot surface by six-inch vertical face curbing. Sidewalk design and installation shall comply with federal requirements of the Americans with Disabilities Act (ADA) and shall incorporate barrier-free access ramping at points of intersection with street crossings and at other locations so as to accommodate barrier-free pedestrian movement and access to buildings, parking areas, and other site amenities. Sidewalks shall be free of utility poles, bushes, plants, and all other obstructions. All proposals requiring submission of a major subdivision or land development plan for review and approval by the Commission shall demonstrate compliance with the provisions of this section on the submission plan. In projects containing both residential and nonresidential development, pedestrian access shall be provided between the residential and nonresidential portions of the site. In all cases, sidewalks or other improved pedestrian pathways shall be installed to provide linkages to surrounding properties (whether improved or vacant). Landscape and tree planting requirements. Design should be simple and easy to maintain and shall consist of a combination of hardy canopy trees, low evergreen shrubs and turf grass. Ornamental and evergreen tree plantings may be incorporated in the design but shall not be the predominant plant types on the site. Trees shall be planted in nonwoodland areas at a rate of one tree per 3,000 square feet of land area developed. For purposes of this subsection, the "land area developed" shall mean that nonwoodland portion of the site which is situated within the limits of disturbance as defined on the development plan. A tree preservation and planting plan meeting the criteria of § 187-76 above shall be prepared and submitted for review by the Regional Planning Commission as part of the formal plan review process. Standard for deciduous tree plantings. Trees shall be of a high canopy variety and shall be limbed to a minimum height of 12 feet above grade at maturity. Standards for evergreen tree plantings. Evergreen tree plantings shall be at least four feet in height at the time of planting. Standards for shrubbery. Shrubbery shall be of a low evergreen variety and shall be limited to use as foundation plantings and for screening purposes. Standards for ground cover. Ground cover shall be limited to turf and ornamental grasses and ornamental evergreen ground cover plantings within required landscape areas. Alternative ground covers, such as wildflowers and meadow grasses, may also be considered. Replacement guarantee. A one-year full-price replacement guarantee shall be provided by the applicant and noted on the record plan for all required new tree plantings. Performance bond. The County may require the applicant or applicants to provide a performance bond or other guarantee for the cost of required landscaping in accordance with Article XIII, § 187-83 of the Kent County Subdivision and Land Development Chapter. All residential subdivisions and land developments shall provide recreational areas in a size equal to 450 square feet per dwelling unit. Area limitation. Not more than 15% of any project site area may be reserved and/or dedicated to nonresidential uses. The Regional Planning Commission may approve an increased percentage of nonresidential site area, provided the applicant demonstrates to the satisfaction of the Regional Planning Commission that the increase will result in an extraordinary benefit to the residents of the development, and within the surrounding neighborhood. Individual commercial and nonresidential buildings shall be limited to a maximum floor area not to exceed 10,000 square feet except that neighborhood shopping centers shall be limited to a maximum floor area not to exceed 50,000 square feet. The Levy Court may authorize commercial and nonresidential buildings in excess of 10,000 square feet and shopping centers in excess of 50,000 square feet if approved by the Levy Court through the conditional use site plan review process as described in § 187-40 above. Recreational facilities such as clubhouses for civic associations designed and operated for the exclusive use of a specific subdivision will not count toward the permitted 15%. Nonresidential uses. Nonresidential uses proposed as part of a TDR receiving area plan shall be designed as an integral part of the proposed development and primarily intended for the direct benefit of residents of the proposed development. Indoor recreation: racquetball, tennis, etc. Gasoline pumps. Gasoline pumps proposed as a component of a TDR development project shall only be permitted if approved by the Levy Court through the conditional use site plan review process as described in § 187-40 above. In addition to the minimum requirements for conditional use site plans, gasoline pumps shall also demonstrate compliance with § 205-296 of the Zoning Chapter and may be subject to any additional conditions determined by the Levy Court to protect the health, safety and welfare of the citizens of Kent County. When adjoining or across the street from an existing or planned residential lot or use, the drive through lane shall be setback at least 100 feet from the adjoining residential lot line. When adjoining or across the street from existing or planned residential lots or uses, the drive-through lane, order station and pick-up window shall be screened by a continuous opaque barrier of at least four feet in height to run the entire length of that portion of the drive-through lane that would be in direct view of the residential lot or use. The opaque barrier shall conform with the material requirements for opaque barriers set forth in § 187-79A(1) (Opaque barrier options). Drive-through service lanes shall be designed to accommodate at least six automobile stacking spaces for each drive-through lane. Stacking space shall be at least 108 linear feet in length measured from the beginning of the drive-through lane to the pick-up window. Lot coverage. Each nonresidential lot shall have a minimum of 25% of the lot area dedicated to be landscaped open space . Front yard. Each lot shall have a landscaped open space of at least 25 feet in width measured from the back of the curb along the entire frontage of the lot, except at points of site access. Trees shall be provided along the frontage perimeter at a minimum rate of one tree for each 50 linear feet of frontage. Side and rear yards. A minimum of 15 feet of landscaped open space shall be provided along all side and rear lot lines when abutting a residential use and a minimum of five feet when abutting a nonresidential use. Tree plantings shall be provided along all nonfrontage perimeters at a minimum rate of one tree for each 75 linear feet. Building placement. Nonresidential buildings shall be situated on the property so as to maximize the use of the frontage along the roadway. Landscaped buffers. There shall be a landscaped buffer area of at least 12 feet in width between the principal buildings and customer parking lot and drive areas, exclusive of drive-up service lanes and customer service window areas, rear driveways, and loading areas. 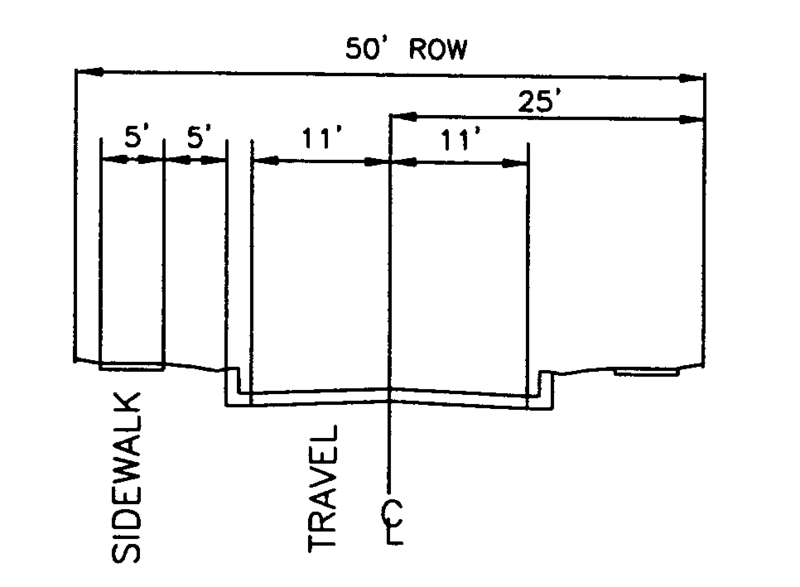 The buffer area shall include provisions for a sidewalk of at least six feet in width and no greater than eight feet in width. The buffer area and sidewalk shall be grade separated from the parking lot by concrete curbing of at least six inches in height. Drive-in service lanes, canopy areas, customer service windows, and accessory buildings and structures shall be exempt from the design requirements of this subsection. Location. Parking shall not be permitted to be situated within the front yard nor between the right-of-way line and the building except in the following instance: Neighborhood shopping centers as defined above, in which case parking may be permitted between the building and the roadway, provided that such parking is limited to two rows of single parking spaces between the road and the storefront. Layout. Parking lots shall be arranged in such a manner so that not more than 20 parking spaces in a row shall be permitted without a landscaped island. No more than six rows of 20 spaces shall be provided without provision for a landscaped median. Parking lot landscape islands shall be a minimum of 10 feet wide and planting medians shall be no less than eight feet wide. Landscape buffers. Parking lot screening adjacent to public right-of-way. Low-profile screening shall be required when parking spaces would result in vehicles facing onto the roadway. Screening may consist of a low wall, evergreen hedge with minimum height of two feet at time of planting planted three feet apart on center and a maximum height of three feet at maturity, or earth berm. Should a low wall be used, such wall shall be accompanied by evergreen shrub plantings on the roadway side of the wall and spaced 10 feet apart on center. Interior landscape. A minimum of 5% of the interior area of a parking lot shall be reserved for landscape purposes. This provision shall include the landscaping of all required parking islands and medians. Shade trees shall be incorporated within the landscaped islands whenever and wherever practicable. Vehicular site entrances for nonresidential uses. Number of vehicular site entrances. One vehicular site entrance shall be permitted for each street which abuts a site. For sites with aggregate street frontage in excess of 300 linear feet, one additional vehicular site entrance may be permitted. For sites with aggregate street frontage in excess of 600 linear feet, two additional vehicular site entrances may be permitted. Shared access among adjoining properties shall be provided whenever possible for entrances to adjoining uses, including residential driveways. Cross access shall be provided among abutting uses of similar use categories, whenever possible, to provide linkage between properties as an alternative to re-entering the main collector corridors to access both existing and future neighboring properties. Entrance locations for adjoining properties. Nonresidential site entrances shall be no closer than 25 feet to an adjoining property, which is zoned residential and no closer than 10 feet to an adjoining property, which is in a nonresidential zoning category. The Delaware Department of Transportation has final authority and approval over the location of all access points. Adjustments to bulk standards. When it can be demonstrated to the satisfaction of the Regional Planning Commission through the site plan review process that, due to specific constraints related to lot configuration, orientation of existing buildings on adjacent lots, existing built conditions, or specific design objectives, the area and bulk requirements listed above cannot be met, the Commission may authorize alternative lot coverage, setbacks, building placement, and parking lot configurations. However, parking within the front yard or between the right-of-way line and the building shall be limited to no more than 50% of the total parking required for the proposed use and such parking must be adequately landscaped and screened from the roadway. The principal building facade of proposed buildings should be oriented toward the primary street frontage, and in the same direction as the majority of existing buildings on the frontage street. Proposed buildings on corner properties should reflect a public facade on both street frontages. 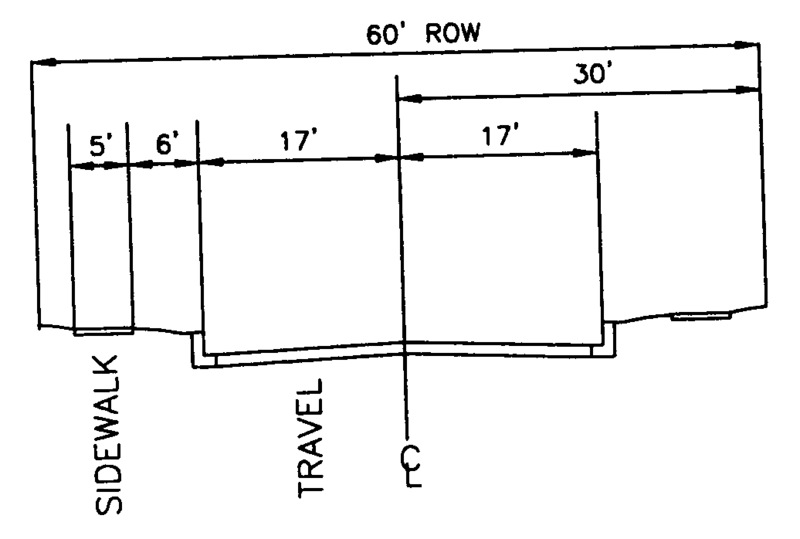 See Figure 187-90.1-H below. In designing new buildings, consideration should be given to the dominant architectural features of existing buildings in the immediate vicinity, as applicable. However, strict adherence to existing architectural styles is not the predominant goal of this section. Existing architecture should be utilized as a frame of reference for proposed architecture, but should not be the sole design template in every instance. Large expanses of blank walls are to be avoided. The public facade shall incorporate windows and primary doorway entrances along the street frontage, as well as projecting elements such as eaves, cornices, canopies, projecting bays, shadow lines and overhangs. Materials. The plan shall incorporate durable exterior surface materials complementary with the color, texture, size, and scale of exterior materials reflected on existing buildings in the immediate vicinity. Roofs. The general roof shape, ridge and eave heights, and material characteristics proposed shall be visually compatible with these same attributes expressed in existing buildings along the subject street, or in the immediate vicinity. Because of the higher density permitted within TDR receiving area communities, structures in such communities are expected to achieve a higher standard of community and architectural design. Developments should be designed with architectural diversity and character in mind to provide a high level of design quality in the built environment. Developers, architects, and designers are to be afforded flexibility to meet the challenge of designing attractive, higher density communities but are compelled to follow the design standards in this article. Inclusion of front porches, projecting bays, vestibules. Single-family attached dwelling units containing more than two units in a row shall have facades, which alternate siding styles and patterns to provide visual distinction to each unit. Alternation between siding and brick is encouraged. The facades of single-family attached dwelling units containing more than two units in a row shall be offset by at least three feet per unit in order to provide architectural relief. No more than six attached dwelling units in a row are permitted. Rear access. The use of alleys for purposes of utility routing, service delivery, off-street parking, and rear lot access is required. However, when it can be demonstrated to the satisfaction of the Regional Planning Commission that due to unique circumstances alleys would be impractical in certain portions of a development plan, the Commission may waive the requirement for rear access. At least 60% of the exterior of each multifamily building shall be of masonry brick construction. The proportion of window and door openings to solid wall areas shall be consistent throughout the architecture. At least two vertical off-sets for each of the long sides of each building shall be incorporated. Off-sets shall be at least five feet in depth and extend a distance equivalent to at least one-third of the long side building facade. Horizontal elements such as masonry band courses, lintels, balcony projections, projecting eaves and cornices shall be incorporated. Architectural review. 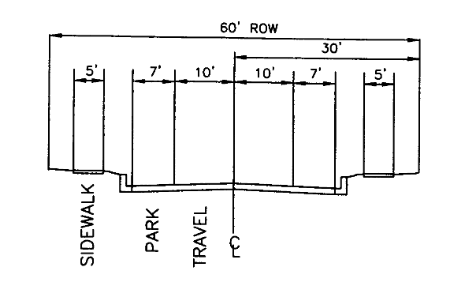 The side of any building which fronts on a major or minor collector or arterial roadway shall be referred to as a corridor elevation. The corridor elevation shall contain architectural elements traditionally associated with the front of a building. Blank walls without functioning windows are prohibited along the corridor. Windows must be incorporated into the overall design concept of the corridor elevation. Providing one or several small windows on a large corridor elevation shall not constitute compliance with this section. A "functioning window" shall be defined as a window which lets light into the interior of the structure, and is integrated and related to the interior layout of the space. A primary entrance door or doors (except for loading doors). A primary entrance feature, such as a porch, portico, awning, entrance walk, or other similar feature. Landscaping integrated into the building design concept. Architectural or urban design elements which link adjacent structures together, such as plazas, walkways, colonnades, or similar features. Architectural relief, such as vertical and horizontal off-sets in exterior wall elevations, band courses, lintels and sill courses, cornices and the like to create shadow lines. To foster increased architectural diversity, the Regional Planning Commission may authorize a deviation from the stated architectural design standards when, in the opinion of the Commission, such action is warranted to yield superior architectural quality and neighborhood design. The Regional Planning Commission shall consider the physical orientation and architectural characteristics of proposed buildings, the relationship of proposed buildings to existing buildings and to other proposed buildings, and their contributions to the overall image of the immediate vicinity. Design characteristics of proposed buildings and building additions should not detract or devalue existing buildings in the immediate vicinity. The plan shall meet all requirements of Chapter 187, Subdivision and Land Development. County approved certificate of transfer credits from which the proposed development transfer credits are derived as set forth in Section 187-90.1F above. A sanitary sewer technical feasibility study in accordance with Chapter 180 of the Kent County Code and approved by the Kent County Department of Public Works prior to submission. No project shall be considered by the RPC without certification by the Department of Public Works that such study has been completed and approved. In no case shall a project be considered by the Regional Planning Commission unless and until a sanitary sewer is legally and technically available. This provision applies to residential and nonresidential projects of any size. Architectural elevation drawings or other graphic representation illustrating exterior building characteristics of proposed buildings and/or building additions that would be visible from the public right-of-way. Elevation drawings shall be drawn to scale and shall reflect major architectural elements such as exterior surface materials, windows, doors, columns, and wall-mounted signage. Elevation plans are intended to provide a general depiction of the physical appearance, massing and scale of the proposed construction. A final record plat for a subdivision using transferred development rights shall contain a statement setting forth the development proposed, the zoning classification of the property, the number of development rights used, and a notation of the recordation of the conveyance of development rights. TDR development projects. All proposed subdivision and land development projects located within the primary and secondary receiving areas shall follow the applicable review processes as provided in Articles IV through VI for major subdivisions and Article VIII for land development projects of this chapter, except that in every case the required public hearing for the application shall occur at the sketch plan review stage as an initial review and authorization step by the Levy Court. Public workshop. At least 30 days but not more than 180 days prior to formal submission of the sketch plan for any major subdivision or land development application proposal for consideration by the Levy Court under § 187-90.1, the applicant shall be responsible for organizing a public workshop for the purpose of informing the public of the pending development project, and for addressing concerns expressed by the public. The public workshop is expressly intended to establish a dialog between the developer and residents of the surrounding area for the purpose of identifying concerns and possible resolutions. Required materials. The applicant shall provide the Department with both a paper and electronic copy of the proposed conceptual sketch plan as well as the time, date, and location of the public workshop at least 30 days in advance of the public workshop. The location for the workshop shall be in a facility that is easily accessible to the immediate community surrounding the project. Mailed notice. The applicant shall provide notice of the time, date and place of such public workshop to all property owners within 200 feet of the extreme limits of the subject property as their names appear in the County tax record and to such other interested parties as may be determined by the Department. Such notices shall be mailed at least 10 days prior to the workshop. Published notice. In addition, notice of the workshop shall be published in a newspaper of general circulation, in the area of the application site, at least 10 but no more than 30 days prior to the workshop. Posted notice. 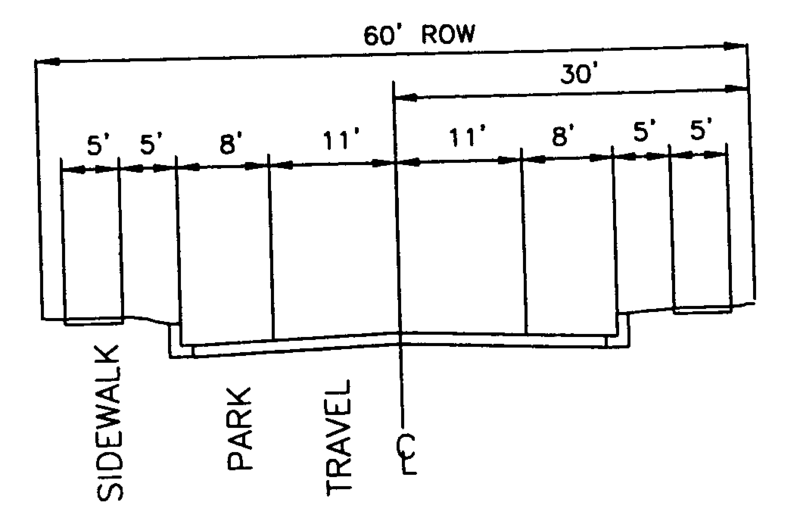 The applicant shall provide and post a sign in compliance with specifications established by the Department of Planning Services, which shall be placed in a conspicuous location (no greater than seven feet from a residential or local road right-of-way, and no greater than 10 feet from a collector or arterial right-of-way); one along each adjacent right-of-way (two if the parcel is bisected by a public road) perpendicular to the street so as to be clearly visible to the public. The posted sign shall consist of a four-foot-by-four-foot laminated sign with a yellow background with two-inch black lettering in a sans serif typeface. The sign shall include a brief description and data column of the proposed development project; the time, date, and place of the public workshop; and a full size copy of the proposed development plan. The applicant shall provide to the Department photographic proof of posting with a signed affidavit. Failure of any such posted notice to remain in place after the notice has been posted shall not be deemed a failure to comply with these standards or be grounds to challenge the validity of any decision made on the application unless the notice was removed by the applicant or at his or her direction. The applicant shall cause the preparation of a detailed transcript of the public workshop by a court reporter for the purpose of recording and transcribing the presentation and discussion at the workshop. The transcript of the workshop shall be furnished to the Department for review, reference, and inclusion in the application file. The applicant shall be responsible for all costs associated with the workshop, including, but not limited to, advertising, mailing and postage, Department staff time, and court reporting. Public hearing. At the initial public hearing step with the Levy Court, the applicant shall present a conceptual sketch plan, a written statement documenting the project's compliance with the provisions of § 187-90.1, Subsection A (Purpose and intent) of this article, and the official transcript from the public workshop step described above. The conceptual sketch plan shall reflect the general layout of streets, housing areas and types, and open space and recreation areas, and shall include all information required in accordance with § 187-18 and Appendix A for Major Subdivision sketch plan submissions, and in accordance with § 187-36 and Appendix D for other land development sketch plan submissions. The Levy Court shall determine whether the proposed project is of such a design and type that warrants further review by the Regional Planning Commission. If the Levy Court determines that further review is warranted, the second step in the review process shall involve a submission of the preliminary plan for review and consideration by the Regional Planning Commission in accordance with the provisions of § 187-20 for major subdivision plans and in accordance with § 187-38 for other land development projects. If the Levy Court determines that a project as proposed does not satisfactorily meet the purpose and intent of this article as articulated in § 187-90.1, and that further review of the project is not warranted, then the project shall not proceed to the Regional Planning Commission. Public notice. The public hearing on the conceptual sketch plan shall be conducted during a regularly scheduled meeting of the Levy Court, no later than 60 days after the filing of the application for consideration. Such period may be extended by mutual agreement between the Levy Court and the applicant. The applicant shall notify by mail all property owners within 200 feet of the extreme limits of the proposed transfer of development rights project as their names appear in the County tax record at least 10 days prior to the hearing. The applicant shall provide the Department of Planning Services with a copy of the notice sent to property owners and post office receipts on or before the public hearing date. The Department of Planning Services shall provide notice to the general public of the public hearing before the Levy Court by publishing the date, time, place, and nature of the hearing at least 10 days before the hearing in a newspaper of general circulation in the County. The Planning Services staff shall post a notice outlining the time, date, place, and nature of the hearing in a conspicuous location on the property. The published and posted notices shall contain reference to the time and place or places within the County where the proposed conceptual sketch plan may be examined. At the hearing, the Levy Court shall receive a report from the Planning Services staff, together with any comments and recommendations received from other County departments and/or outside agencies. Interested parties shall have the opportunity to offer testimony both in favor of and in opposition to the proposed sketch plan. Preliminary and final plans. Preliminary and final plans shall require review and approval by the Regional Planning Commission as well as a determination of consistency by the Levy Court resulting in a resolution of approval as set forth in Articles V, VI, and VII above. Municipal review. For transfer of development rights projects located within a one-mile radius of a municipality, the municipality shall be provided the opportunity to review and comment upon the proposed plan. The Department shall be responsible for forwarding plans to the respective municipalities at least 45 days prior to the RPC meeting. Annexation provision. When the receiving area for a transfer of development rights project is located within a municipal annexation area as designated in the certified comprehensive plan for the municipality, the applicant for the project shall afford the municipality the opportunity to annex the land and accept the planned TDR project. If the municipality should choose to annex the land, the applicant shall be obligated to proceed with the annexation and develop the TDR project within the municipality. Written notification of the municipality's decision to permit the transfer of development rights project shall be provided to Kent County. Should the municipality choose not to annex the property, the applicant may develop according to Kent County's TDR requirements. Written notification of the municipality's decision to not annex the property and permit the transfer of development rights project shall be provided to Kent County. Memorandum of understanding. Kent County shall enter into an agreement with interested municipalities through a memorandum of understanding detailing the process and requirements for TDR development within the municipality's boundaries. Municipal annexation plans. In the event that a municipality initiates a formal amendment proceeding with the State of Delaware for the purpose of amending the annexation plan component of its certified Comprehensive Plan to incorporate specific lands designated as TDR receiving areas into its annexation plan, then Kent County shall refrain from considering TDR development projects within such specific receiving areas for a period not to exceed 183 calendar days (six months) from the date of enactment of the Kent County Transfer of Development Rights Ordinance, or until the date of recertification of the municipality's Comprehensive Plan and Annexation Plan as amended by the State of Delaware, whichever comes first. Performance review. This section shall be reviewed every five years from the date of adoption for consistency with the Kent County Comprehensive Plan and for general effectiveness in land use planning. This five-year review shall not be construed to mean the County cannot review and amend the section more frequently. Strategies for state policies and spending. Upon the enactment and/or adoption of the Strategies for State Policies and Spending document by the State of Delaware, and upon any update or revision of that document, Kent County shall review the transfer of development rights program Sending Area and Receiving Areas Maps to ensure consistency with the State of Delaware investment strategies maps. Kent County Levy Court reserves the right to amend the Sending Area and Receiving Areas Maps as integral components of the Kent County Zoning Map under the provisions of Chapter 205, Zoning of the Kent County Code. Effective date. This Transfer of Development Rights Program Ordinance shall become effective on January 1, 2005, and shall remain in effect unless and until amended or repealed by the Levy Court of Kent County. The public facilities and/or services needed to support, and off-set, the impacts of new development are planned and funded for construction within two years of final plan approval. Facilities and services relating to roads, schools, emergency medical services, and water supply and distribution systems meeting minimum acceptable level of service standards established by Kent County Levy Court. A defined area within which a proposed development is presumed to create a demand for public services and facilities and so is evaluated for compliance with this section. The maximum demand that can be accommodated by a public facility or service without exceeding the adopted level of service. For water supply and distribution, capacity shall be measured in terms of the documented water supply and projected fire hydrant discharge rates in gallons per minute (GPM) to be provided within new development projects. For emergency medical services, capacity shall be measured in terms of the aggregate average call volume to the Kent County Emergency Dispatch Center as determined by the Kent County Department of Public Safety. For roads, capacity shall be measured by the maximum number of vehicles that can be accommodated at an intersection during peak-hour periods while maintaining the level of service standard as set forth in this section and in accordance with Delaware Department of Transportation Rules and Regulations for Subdivision Streets and the Highway Capacity Manual as amended. For schools, student capacity ratings shall be determined in accordance with the most recent September 30 unit count and school capacity ratings established by the Delaware Department of Education. The existing capacity available from a facility or service to accommodate a new development project. The capacity to be created by programmed capital improvements. The anticipated demand created by previously approved but unbuilt dwelling units. The performance standard adopted by Kent County Levy Court for the provision of roads, schools, emergency medical services and water supply and distribution. The adopted minimum acceptable level of service shall provide a basis for the establishment or expansion of a public facility or service, which is subject to this section. The rated student capacity of each school as determined by the Delaware Department of Education. Portable classrooms shall not be used in computing the school capacity for the purposes of this section. A unit of geography used in transportation planning models. The spatial extent of the zones typically varies from very large in rural areas, to smaller areas in more urbanized places. The areas are defined based upon population and housing unit data derived from the most recent decennial census data. For purposes of this section, the term “Traffic Analysis Zone” means and refers to those established and defined by the Delaware Department of Transportation. Editor's Note: This ordinance provided that it shall be effective upon enactment of state legislation amending or repealing § 9124(b) of Title 29 of the Delaware Code so as to allow implementation of this ordinance. Conditional use applications not requiring site plan review. This section shall be administered by the Levy Court and/or the Regional Planning Commission in conjunction with the Department of Planning Services, in accordance with the jurisdiction and authority set forth for each of these entities with this chapter. All applications, maps, and documents relative to major subdivision, conditional use site plan or site plan approval subject to the provisions of this section shall be submitted to the Department of Planning Services for review and consideration as part of the plan review process. This section applies to all applications for major subdivision, conditional use site plan and site plan review for new construction filed after the effective date of this section. Except as provided in Subsection D above, all development proposals shall demonstrate compliance with the requirements set forth in this section through the preliminary conference review process set forth in § 187-17 for major subdivisions, and § 187-35 pertaining to land development applications for site plan and/or conditional use plan review prior to submission for consideration. The provisions of this section shall not apply to minor subdivision plans, conditional uses not requiring site plan review, and site plans involving less than 5,000 square feet of building floor area. Levels of service for public facilities shall be evaluated during the preliminary conference review process described in § 187-17 and § 187-35. The applicant shall be required to demonstrate compliance with the level of service standards set forth in Subsection F (Level of service standards) of this section prior to formal submission for all of the above-referenced land use applications. The applicant shall provide a level of service analysis report to the Department of Planning Services for review during the preliminary conference review process. Proposal explaining how compliance with the level of service standards would be achieved and/or maintained if the project is approved. Based upon the level of service analysis performed under Subsection E(4) above, the Director of Planning Services or designee shall report the findings and provide recommendations to the Regional Planning Commission and/or Levy Court pertaining to the maintenance or attainment of the level of service standards through the applicable development plan review process set forth in this chapter. Reduce the residential density and/or building floor area, and/or intensity of use to reduce the impact on the capacities of public facility services to achieve compliance with the level of service standards of this section. Editor's Note: This ordinance provided that it shall be effective upon enactment of state legislation amending or repealing § 9124(b) of Title 29 of the Delaware Code so as to allow implementation of this ordinance. Section 2 of this ordinance provided that, not less than 30 calendar days following the preapplication meeting set forth in § 187-17, an applicant may request exemption from any or all provisions of this chapter based on good-faith reliance on the state of law that existed prior to the enactment of this ordinance to his or her substantial detriment. Ord. No. 06-42 includes the full text of the procedure for requesting this exemption, which automatically terminates 18 months from the enactment of Ord. No. 06-42. Subdivision plans, conditional use site plans, or site plans that will not maintain or achieve compliance with the level of service standards set forth herein shall not be approved. Effect of determination. The determination of adequacy of public facilities shall remain valid for as long as the subdivision or site plan is considered valid. The determination shall expire upon the expiration of the subdivision or site plan in accordance with §§ 187-14, 187-21, and 187-41 of this chapter. Proposals found to be in compliance with the level of service standards of this section shall not be construed to be exempted from standard plan review and permit requirements (§§ 187-24 and 187-42). Central water service. All proposed residential subdivisions involving more than 10 lots shall be served by a central water system that includes fire hydrants located in accordance with Delaware State Fire Protection Regulations. Fire hydrant yields (gallons per minute) shall comply with the minimum requirements as set forth by the State Fire Marshal's Office. A plan showing the water distribution system, including the location of fire hydrants, shall be provided with all major subdivision applications involving more than 10 lots. To offset the increased cost of providing emergency medical services (EMS) to an expanding County population, an EMS impact fee shall be assessed. The level of service standard for emergency medical services shall be based upon aggregate average call volume to the Kent County Emergency Dispatch Center. It has been determined that on average, 0.07 dispatch calls per person are received by the Kent County Department of Public Safety each year. Based on the dispatch call factor of 0.07 calls per person per year, the number of calls generated by proposed residential development shall be determined. The projected number of dispatch calls per year shall be determined by projecting the total population of the proposed residential development at build-out using the average number of persons per household for Kent County as determined by the most recent population statistics published by the United States Census Bureau. The Kent County Department of Public Safety shall calculate the total impact fee to be assessed per dwelling unit for each new residential development proposal. The impact fee shall be based upon the projected number of annual dispatch calls for the proposed development multiplied by the per-capita EMS costs based upon the most recent reporting year. The impact fee for the proposed development shall be apportioned equally to each proposed dwelling unit, and shall be paid to Kent County on a per-dwelling-unit basis prior to the issuance of a building permit. The EMS impact fee shall be automatically adjusted on January 1 of each year based upon the average per-capita EMS costs derived from the most recent reporting year as determined by the Department of Public Safety. All EMS impact fee funds collected shall be deposited into a reserve account for the purpose of funding upgrades and/or expansion of County EMS services and/or County EMS infrastructure within Kent County. The funds generated by said expansion fee shall be held in a separate interest-earning expansion reserve account. Purpose. The Regional Planning Commission shall not approve any major subdivision or site plan proposal, and Levy Court shall not approve any conditional use site plan proposal, if the proposed development cannot achieve the level of service standards set forth in this section; except, however, the Commission and/or Levy Court may approve such a project conditioned upon the applicant completing all required road improvements necessary to achieve the level of service standards for adequacy of the facility. This subsection shall apply only to minor arterial, major and minor collector, and local roadways as defined by the most recent version of DelDOT's Functional Classification Map. Limited-access roads shall not be subject to the provisions of this subsection. Capacity calculation. The transportation capacity for a proposed development shall be determined by a traffic impact study or other method acceptable to DelDOT such as the Support Facilities Report. The applicant shall follow the methodology set forth in this section to determine the highway capacity within the area of influence of the site. The proposal exceeds the projected average daily traffic warrants provided in DelDOT's Rules and Regulations for Subdivision Streets, as amended. The proposal is projected to generate more than 50 peak-hour trips, excluding traffic passing by the subject property, unless the project is located in a DelDOT Special Study Area or District as designated by mutual agreement between Kent County and DelDOT. The area of influence of the subject property includes roadway segments and intersections currently operating below the level of service standard specified in Subsection F(3)(j), Adequate level of service, below. The proposed development causes the total number of dwelling units within the area Traffic Analysis Zone (TAZ) to exceed the projected totals set forth in the Dover/Kent County MPO Transportation Improvement Plan. The proposed project is within a transportation improvement district or similarly defined area as designated by mutual agreement between Kent County and DelDOT, as identified by DelDOT, and trip generation numbers provided for the proposed subdivision or land development, as approved by DelDOT, do not change the projected traffic volumes upon which roadway improvements designed by or approved by DelDOT for the district or area have been based by more than 5%. The applicant shall contribute to transportation improvement costs within the district or area based upon a formula to be developed by DelDOT. Scoping meeting. Within 15 days after the Department or DelDOT determines that a traffic impact study is necessary, the Department and DelDOT shall meet with the applicant to establish the area of influence and all traffic impact study parameters. The area of influence will be based upon comparisons of the anticipated site traffic to the existing traffic on roads in the immediate vicinity. Once established, no substantial modification to the area of influence and parameters shall be made by the applicant without the approval of the Department and DelDOT. Such approval shall only be given if the applicant can demonstrate to the satisfaction of DelDOT and the Department that the data relied upon to determine the area of influence and parameters is flawed or otherwise inaccurate. Ten percent of the annual average daily traffic on the intersecting road if it is a local road. The study area shall always include the site entrances. 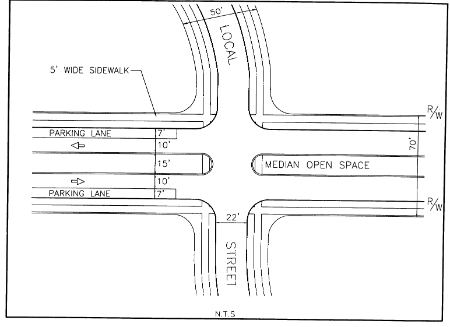 If the site would have access on two or more intersecting roads, the study shall include their intersections. The study area shall extend at least to the nearest arterial or collector road but in no case less than three intersections with state-maintained roads from the site. 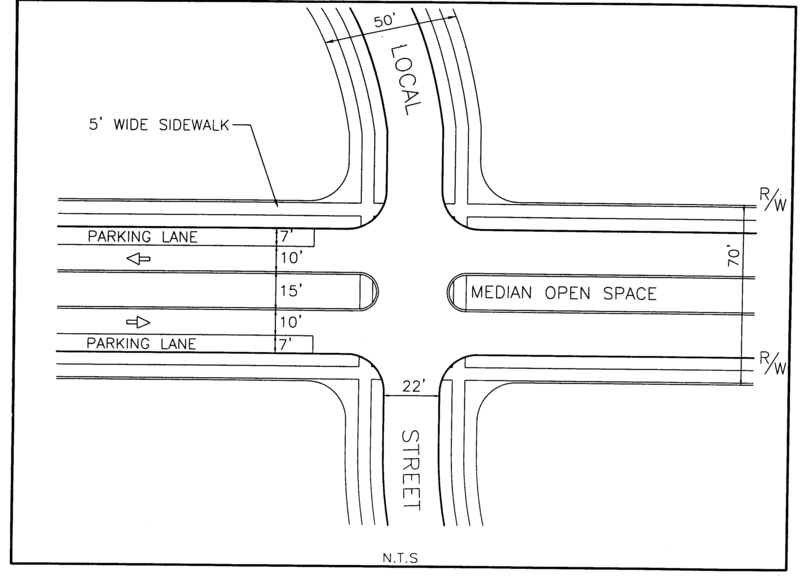 Intersections with commercial entrances may be considered as part of the study at the discretion of the Department and DelDOT. For the purposes of this section, average weekday vehicle trip ends generated by retail commercial uses shall be reduced to account for pass-by trips based on the standards included in the ITE Trip Generation Handbook, as amended. For uses that operate on an event basis, e.g., stadiums and arenas, the Department and DelDOT shall substitute professional judgment for Subsection F(3)(f) in determining the area of influence. Traffic impact study requirements. A traffic impact study shall be prepared by individuals or firms that perform traffic engineering, which shall be reviewed and sealed by a Delaware registered professional engineer. The content and format of the study shall be as prescribed by DelDOT's Rules and Regulations for Subdivision Streets, as amended. DelDOT report required. Upon receipt of a final traffic impact study, DelDOT shall review the traffic impact study pursuant to this article and submit written comments to the Department. The review of the traffic impact study shall include review comments and recommendations in accordance with DelDOT's Rules and Regulations for Subdivision Streets, as amended. Subdivision or land development traffic impact study plan approval. The accuracy, completeness, and thoroughness of the traffic impact study as well as whether the study was conducted in conformance to the study parameters set by the Department and DelDOT. The level of service standards of this section. Appropriateness and adequacy of all proposed mitigation measures as described in Subsection F(3)(k) below. Compatibility with regional and state transportation plans and nearby development proposals currently under review by the Department of Planning Services. Design principles and standards as described in this chapter (e.g., interconnectivity, transit/pedestrian accessibility and street design). The applicant may request permission to revise the proposed plan and traffic impact study to include additional traffic mitigation measures necessary to achieve the specified level of service standard within the project's area of influence. The proposed revisions shall be submitted by the applicant to the Department and DelDOT for review. The applicant may submit a revised plan that would generate fewer trips that does not exceed the levels of service standard. If the traffic impact study is approved or approved with conditions for a major subdivision plan, the applicant may proceed with a preliminary subdivision plan submission. If the traffic impact study is approved or approved with conditions for a site plan or conditional use site plan, the applicant may proceed with submission of those plans in accordance with the processes set forth in this chapter pertaining to such plan types. Within the Growth Zone Overlay District. 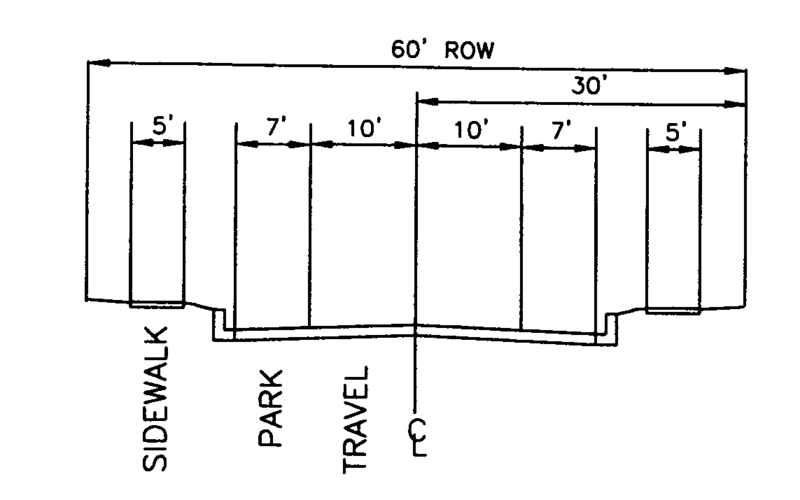 The minimum acceptable level of service standard for roadway segments and intersections within the Growth Zone Overlay District shall be Level of Service D.
Editor's Note: This ordinance provided that it shall be effective retroactively to 6-13-2006, the established effective date of the original Adequate Public Facilities - Roads Ordinance (Ord. No. 07-08). Outside the Growth Zone Overlay. The minimum acceptable level of service standard for roadway segments and intersections outside the Growth Zone Overlay District shall be Level of Service C.
If the existing level of service for an intersection or road segment is below the required level of service standard as specified above, the existing level of service shall, at a minimum, be maintained, and shall not be further reduced. This provision shall not relieve an applicant from making safety and capacity improvements as recommended by DelDOT or as part of a traffic impact study. The construction of off-site road improvements by the applicant or others that result in compliance with the level of service standards. The specific traffic mitigation measures shall be chosen based on their ability to reduce the impact of traffic generated by the proposed subdivision or land development, in order to achieve and maintain the level of service standards for a minimum of two years for roadway segments and intersections within the area of influence. All proposed traffic mitigation measures approved by the Levy Court or Regional Planning Commission through the plan approval process shall be conditions of plan approval. No building permits shall be issued for new construction unless approved traffic mitigation measures are under construction, and no certificate of occupancy for any building shall be issued unless and until all traffic mitigation measures are completed in phase sufficient to maintain the level of service standards. The developer has executed an agreement with the County to pay mitigation to the school district within which the proposed subdivision is located to compensate for the impact of the proposed subdivision based upon the formula described in Subsection F(4)(e) below. Subdivision plans, conditional use site plans, or site plans that will not achieve compliance with the provisions of Subsection F(4)(d) shall not be accepted by the Department of Planning Services for review and shall be returned to the applicant in accordance with § 187-13 of this chapter. Subdivisions and land developments comprising housing intended for occupancy and use by individuals age 55 and older pursuant to the provision of the Housing for Older Peoples Act (HOPA) of 1995 of the Federal Fair Housing Act, 42 U.S.C. § 3601 et seq., shall be exempt from these provisions. Applicants shall demonstrate compliance with the Fair Housing Act provisions, including applicable deed restrictions prior to final plan approval. The level of service for all schools (elementary, middle, and high) is 100% of state-rated capacity. If any school within a district does not have adequate capacity to serve existing and projected enrollment, capacity for the entire district shall be considered inadequate. Available capacity for individual schools shall be determined in accordance with Subsection F(4)(d), Measuring for available capacity, below. Compliance with the level of service standard shall be determined at the preapplication and preliminary plan review stage. Final plat approval shall not be granted for developments until the affected schools obtain adequate capacity or the developer has executed an agreement with Kent County to pay mitigation to the school district. For determination of available capacity, the Department of Planning Services shall analyze the most current enrollment data and student capacity ratings for the school district prepared by the Delaware Department of Education for adequacy. Projected additional student enrollment that would result from this proposed development in conjunction with the committed development shall be determined and included in this analysis. Student generation related to committed development shall reflect projected enrollment increases associated with all additional approved, but not recorded, major subdivision plans, and recorded, but not built, major subdivision plans in the school district. If any of the above calculations results in a fraction, the number shall be rounded up to the next whole number. The proposed residential development shall be considered compliant with the level of service standard when the combination of existing enrollment, projected student enrollment related to the proposed development, and student generation related to committed development is less than or equal to available capacity of all schools within the applicable district. The Levy Court or Regional Planning Commission approves a project phasing schedule that limits the construction of the project to a maximum annual build-out rate that achieves compliance with level of service standards. Per-household mitigation payments shall be calculated at the final plan approval stage by multiplying the total student generation rate by 35% of the most recently established local school district share of total average cost per student for school construction as determined by the Department of Education. *This example is for illustrative purposes only. The Total Per-Student Construction Cost and the Local Share are subject to change and revised periodically by the Delaware Department of Education; and the Student Generation Rate is subject to change based upon the most recent decennial census data for average school-aged children per household, and by age cohort. Based upon changes to those factors, the Per-Household Mitigation Payment is subject to change accordingly. The mitigation payment due for each lot shall be payable at the time of building permit. The payment shall be made directly to the respective school district and a receipt provided to the Department of Planning Services. Limitations on residential building permit approvals. The Levy Court shall have the authority to limit the number of building permits for new residential units in school districts that do not have adequate student capacity as determined in Subsection F(4)(d). The Levy Court may limit the number of residential building lots that may be approved for development on an annual basis in school districts for which all available school capacity has been utilized. Editor's Note: See the Editor's Note following Subsection F(3) for the vested rights and exemption set forth in Section 6 of this ordinance. Advancement of facilities. Except as otherwise provided, if the level of service analysis report required in Subsection E(4) above reveals that available capacity of a public facility is not adequate for the planned development, the Levy Court and/or Regional Planning Commission may permit the applicant to advance the public facilities which are deficient, subject to the provisions below. The applicant furnishes a bond or other financial assurance sufficient to guarantee the completion of construction of the public facility to be advanced. At the option of the Levy Court and/or Regional Planning Commission and only if the public facility improvement to be completed by the applicant would create capacity exceeding the demand generated by the proposed development, a recoupment plan that would enable the applicant to recoup the costs associated with creating excess capacity from future development proposals within the area of influence that would utilize the excess capacity. A recoupment plan shall quantify the availability of excess capacity in terms of equivalent dwelling units, the dollar costs incurred by the applicant in creating excess capacity, and the unit cost per equivalent dwelling unit that would be assessed to future development projects within the area of influence. All recoupment plan proposals require approval of Levy Court or Regional Planning Commission in accordance with the jurisdiction and authority of each body as set forth in this chapter. The construction or funding of the balance of the public facility that is needed to meet the adopted level of service will be accomplished from other sources. Editor's Note: This ordinance also redesignated former Subsection G as Subsection H.
Appeals procedure. Any applicant aggrieved by a determination by the Regional Planning Commission that adequate capacity is not available to serve a proposed development project and the subsequent denial of the project or conditions of approval intended to preserve capacity may follow the appeals procedure provided in Article XIV, Appeals, of this chapter. Editor's Note: This ordinance provided for an effective date of 6-13-2006. Section 2 of this ordinance provided that, not less than 30 calendar days following the preapplication meeting set forth in § 187-17, an applicant may request exemption from any or all provisions of this chapter based on good-faith reliance on the state of law that existed prior to the enactment of this ordinance to his or her substantial detriment. Ord. No. 06-41 includes the full text of the procedure for requesting this exemption, which automatically terminates 18 months from the enactment of Ord. No. 06-41. A determination is provided by the Department of Planning Services that the community construction, home placements, roads, setbacks, stormwater management features, entrances, and all other site improvements demonstrate compliance with the minimum regulatory requirements in effect at the time of construction of the condominium. Certification from the Kent Conservation District, Delaware Department of Transportation, Delaware State Fire Marshal, Delaware Department of Natural Resources, and Kent County Department of Public Works shall be required as applicable to ensure that the above-referenced site improvements have been constructed and completed as presented on the subdivision plan. Public water and sewer serve all lots. The main lines for all utilities, including, but not limited to, water, sewer, electric, natural gas, cable, and propane, shall be located in common areas. Each lot has at least two off-street parking spaces. The minimum lot size shall be 5,000 square feet. In the case of manufactured homes, all homes must be affixed to permanent foundations with the wheels and axles removed, and the motor vehicle title to each home must be retired after conversion and title thereafter shall be only transferred by deed. One hundred percent of condominium owners must agree, in writing, to the conversion. Two separate maintenance accounts shall be established by the applicant: a fund dedicated and limited to street maintenance; and a fund dedicated to all other property maintenance issues such as open space maintenance, stormwater facility maintenance, sign maintenance, etc. 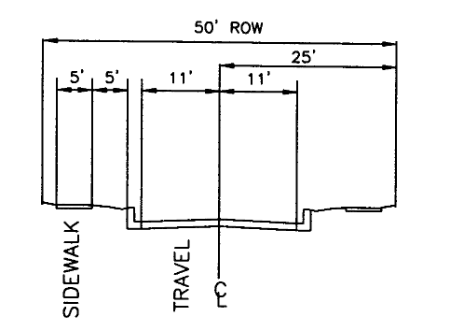 In order to determine the amount to be designated for street maintenance, the applicant shall prepare a street pavement assessment report prepared by a professional engineer which shall determine the construction of the existing streets, provide an assessment of the useful life expectancy of the streets, and provide an estimate of maintenance costs. This report shall provide a recommended annual street maintenance assessment to each homeowner in the neighborhood. In order to determine the amount to be designated for general property maintenance issues, the applicant shall produce an estimate of the annual property maintenance costs, exclusive of street maintenance. This estimate shall provide the amount of an annual property maintenance assessment for each homeowner in the neighborhood. The park or condominium owner shall deposit an amount equal to the per-lot annual street maintenance and general property maintenance assessments, as calculated above, into an interest-bearing escrow account to be turned over to the homeowners' association. All accrued interest shall be turned over to the homeowners' association. The funding of the account shall coincide with the real estate settlement for each lot and shall be completed on or before issuance of 75% of building permits within the subdivision. The developer must demonstrate that the funds have been placed with an independent escrow agent who is not under the power and control of the developer. The escrow agreement shall provide that the funds shall not be withdrawn by the developer or any person acting on behalf of the developer. At the time the homeowners assume control of the homeowners' association and elect a board of directors, the escrow amount plus any interest shall be transferred to the association; however, such transfer shall not occur without the approval of the Department of Planning. A record subdivision plan showing each lot’s metes and bounds, setbacks, and street rights-of-way, and surveyed locations of all dwelling units and accessory structures shall be submitted to the County Planning Office and recorded in the Recorder of Deeds office upon approval of the conversion;. An as-built plan documenting installation of existing roadways, sewer, water and storm facilities shall be submitted to the County Planning Office at the time the record plan is submitted. A homeowners' association or maintenance corporation must be created for the maintenance of all facilities to be held in common ownership. Deed restrictions, articles of incorporation, bylaws, and declaration of maintenance applicable within the subdivision, including agreements for the operation and maintenance by the property owners or agency in the subdivision of any sewage, stormwater management facilities, roads, recreation areas, or other physical facility which is of common use or benefit shall be provided to the Department for review in conjunction with the subdivision plan. All such documents must be recorded in conjunction with the final plan. A conversion pursuant to this section shall be approved administratively, provided the applicant is in compliance with all provisions of this section. The review fee shall be that established for minor subdivision review. Purpose. The purpose of this section is to provide an alternative to homeowner responsibility for long-term maintenance of stormwater infrastructure within subdivisions and land developments and relieve homeowners of the burden of minor and major stormwater maintenance. This section establishes the process for creating and extending a district within and among major subdivisions and land developments in which the stormwater management infrastructure, not owned and maintained by the Department of Transportation, will be maintained by Kent County in coordination with the Kent Conservation District for a fee to be billed by the County on the annual property tax bills of individual lot/unit owners. A repair to stormwater collection, conveyance, and/or management infrastructure in a stormwater management district of an unexpected situation or sudden occurrence of a serious and urgent nature that demands immediate action which occurs outside of normal routine maintenance or scheduled capital improvements and/or repairs within the stormwater maintenance district. Emergency repairs shall be the responsibility of the district. Includes renovations such as replacement of outlet structures and pipes, rebuilding of inlet pipes and aprons, repair of embankments, and in extreme cases, replacing biofiltration media, complete rehabilitation or retrofit. Major maintenance shall be provided for all subdivisions and land developments included in a stormwater management district. Major maintenance activities are further illustrated in the Stormwater BMPs Maintenance Tasks and Responsibilities Guidance Document, and activities for specific stormwater infrastructure shall be included in the operation and maintenance plan. Includes activities which typically occur annually or every two or three years such as removal of accumulated sediments, clearing of obstructions from inlet pipes or outlet structures, management of burrowing animals, stabilization of low-flow channels, resetting of rip rap, and repair of eroded banks. Minor maintenance shall be provided for all subdivisions and land developments included in a stormwater management district. Minor maintenance activities are further illustrated in the Stormwater BMPs Maintenance Tasks and Responsibilities Guidance Document, and activities for specific stormwater infrastructure shall be included in the operation and maintenance plan. Identifies the required maintenance and associated schedule for stormwater management systems. A draft plan shall be provided following the initial letter of intent from a community and a final plan shall be included as part of the resolution adopted by Levy Court creating or extending the stormwater maintenance district. The plan may be subsequently revised with the approval of the Technical Advisory Committee should conditions of the stormwater management system change (e.g., conversion of turf areas to meadow). Includes tasks such as grass cutting, vegetative management, control of invasive species, and trash removal for residential subdivision and land development only. Routine maintenance is an optional service; the stormwater management district will perform this task for HOAs, and a separate fee will be assessed based on factors including square footage or acreage and number of times mowing is to occur each season. Routine maintenance is only available for residential development. Routine maintenance activities are further illustrated in the Stormwater BMPs Maintenance Tasks and Responsibilities Guidance Document, and activities for specific stormwater infrastructure shall be included in the operation and maintenance plan. Includes stormwater collection, conveyance, and management structures shown on approved stormwater management plans and located outside of state-maintained rights-of-way. An area in Kent County, within ascertainable boundaries, and that is in the opinion of the County government susceptible to efficient and economical stormwater maintenance pursuant to the procedures of this section. For water quality control, a system of vegetative, structural and other measures that controls the adverse effects on water quality that may be caused by land-disturbing activities or activities upon the land. All major residential subdivisions, residential land developments, and mixed-use developments (e.g., planned unit developments) that contain stormwater infrastructure approved after the effective date of these regulations shall automatically be included within the stormwater maintenance district prior to final plan approval. Property owners within any subdivision or land development or mixed-use developments (e.g., planned unit developments) requesting public funds for stormwater management structure restoration shall petition, using forms provided by Kent County, to be included in the stormwater maintenance district prior to the dispersal of public funds. Applicants/owners of individual nonresidential land development may request, in writing, to be included in the stormwater maintenance district prior to final plan approval. Service shall include only basins, BMPs, and surface drainage facilities but would exclude proprietary systems, underground storage, underground infiltration, closed drainage systems and catch basins, porous pavement, green roofs, Delaware sand filters, and water harvesting. Inclusion in the district shall be noted on the final plan. Property owners within existing major subdivisions and land development may petition, using forms provided by Kent County, to create or extend the stormwater maintenance district. Establishing a stormwater maintenance district for a subdivision or land development approved after enactment of this section. For residential and mixed-use (residential and nonresidential) subdivision and land development applications, inclusion within the stormwater maintenance district shall be automatic as a condition of preliminary plan approval and shall be memorialized on the final and/or record plan. Individual nonresidential land development applications may be included in the stormwater management district upon the written request of the applicant and/or owner. The inclusion within the district shall be memorialized on the final and/or record plan. Perpetual easements granting the district access for the inspection and maintenance of stormwater management infrastructure shall be shown on the record plan. A separate recorded easement agreement in a form determined by Kent County shall also be required. The district shall not assume responsibility for the stormwater facilities and infrastructure until the subdivision or land development, or phase thereof, is substantially complete and the Kent Conservation District has provided final approval of construction. Fees shall not be assessed to property owners until the district assumes responsibility for maintenance. Once the district assumes responsibility, the units within the subdivision or land development, or phase thereof, shall be subject to annual billing. Establishing a stormwater maintenance district for an existing subdivision or land development approved prior to enactment of this section or located within an incorporated area. A representative of the subdivision or land development shall submit to the Department of Planning Services a letter of intent to petition for inclusion in the stormwater maintenance district. The letter of intent shall be forwarded to the Kent Conservation District for technical review. The Kent Conservation District shall provide the community representative and the Department of Planning Services with a report describing any required repairs to the stormwater system. The report shall also include a draft operation and maintenance plan. Any required repairs shall be completed by the property owners prior to creation of or inclusion in the district. Alternatively, the property owners may petition the district to complete the repairs and the cost apportioned to the property owners for payment based upon a schedule to be established in the resolution creating the district. When a subdivision is still under construction, the developer shall represent one vote regardless of the number of individual lots owned. The petition shall include a description of the area to be included in the district and the services to be provided (i.e., to what extent will routine maintenance be performed by the district). Each property owner shall be reflected as voting "yes," "no," or "not available." The petition shall be made to the Department of Planning Services and include a certification that the information provided by the property or unit owner is true and correct. Upon receipt of the petition, the Department of Planning Services shall verify the signatures on the petition, ensure that a majority of the lots are represented on the petition, and forward the request to the Kent Conservation District for technical review and report. For subdivisions and land developments located within incorporated areas, the petition shall be accompanied by evidence of concurrence by the local governing body. Such evidence may include a resolution adopted by the governing body or approved minutes documenting a vote of concurrence by the governing body. After receipt of the Kent Conservation District report, the Levy Court shall introduce a resolution creating or extending the stormwater maintenance district for public hearing. The resolution shall describe the geographic limits of the area, the fee structure used to establish the annual fee to homeowners, any required repairs to be completed for additional payment, and the operation and maintenance plan for the community. Notice to the general public of the Levy Court hearing shall be accomplished by publishing the date, time, place, and nature of the hearing in a newspaper of general circulation in the County. Said notice shall be published by the Department of Planning Services once not more than 21 and at least 10 days before the public hearing and shall contain a description of the boundaries of the proposed stormwater maintenance district and a statement that the County government will hold a hearing to solicit public comment prior to consideration of whether or not to create or extend the proposed district. The notice shall state that in the event the County government decides to create or extend the proposed stormwater maintenance district, the County government will assess the unit costs of stormwater maintenance against each tax parcel or unit property within the stormwater maintenance district. The Planning Services staff will post a notice outlining the date, time, place, and nature of the hearing at all the entrances to the subdivision or land development. If the Levy Court determines, after a public hearing, that it is in the public interest to create or extend the proposed stormwater maintenance district, it shall pass a resolution creating the stormwater maintenance district. A perpetual easement agreement in a form determined by Kent County granting the district access for the inspection and maintenance of stormwater management infrastructure shall be recorded prior to the district assuming responsibility for maintenance. The Levy Court may, without further public hearing, consolidate two or more stormwater maintenance districts into a single district. The stormwater maintenance district may be created at any time; however, Levy Court may establish dates certain that maintenance of and billing for new or extended districts shall commence (e.g., annually or semiannually). Stormwater maintenance district may be modified or dissolved only after a public hearing and vote of the Levy Court. Any application to modify or dissolve the stormwater maintenance district shall follow the steps enumerated in Subsection E above. In order to fund the annual and long-term costs for the stormwater maintenance district, the Levy Court shall establish a fee structure as part of the annual budget and divide the annual cost, plus a pro rata administrative cost, by the number of dwelling units within the stormwater maintenance district to arrive at the annual unit cost. Fees for residential land development (i.e., manufactured-home parks or apartments) shall be assessed to the property owner rather than the unit owner. For mixed-use subdivisions and land developments (e.g., planned unit development), the fee for the nonresidential portion and residential portion in single ownership (e.g., multifamily) shall be calculated based upon equivalent dwelling units (EDU). An EDU would represent the average imperviousness (combined rooftops and driveways/sidewalks) of the residential lots draining to the structure. For example, if the average lot has 2,500 square feet of impervious surface and a commercial building and parking lot has 25,000 square feet, the commercial component represents 10 EDUs. For individual nonresidential land developments, the fee shall be calculated based upon equivalent dwelling units (EDU). An EDU would represent the average imperviousness (combined rooftops and driveways/sidewalks) of AC-zoned residential lots served with public water and sewer and located within the Growth Zone. EDUs for nonresidential development and for residential development in single ownership shall be calculated based upon the drainage area and change in land cover as reflected in the stormwater management plan. For subdivisions and land developments in which the property owners choose to give the district responsibility for routine maintenance, a separate fee shall be added to the standard unit cost. The annual unit cost shall then be assessed against each unit located within the boundaries of the stormwater maintenance district. No parcel of real estate shall be exempt from paying its annual unit cost. After levying the stormwater maintenance fee, the County government shall deliver a separate fee collection warrant to the County Finance Director commanding him or her to collect the stormwater maintenance fee and its amount. The fee shall be levied and collected at the same time and in the same manner as other County taxes and shall be a lien on real property the same as other County taxes. The fee shall be included on the County tax bills under the heading "stormwater maintenance fee." The County shall establish a separate enterprise fund for the stormwater maintenance district(s). District revenue shall be accounted for separately and shall not be available for non-district related expenditures but may be used throughout any of the established district(s). Should responsibility for maintenance be assumed by the district after the commencement of any fiscal year and expenses incurred prior to the first billing, the County government shall include in the next annual budget an amount sufficient to reimburse the general fund for the expenditure during the last fiscal year as well as an amount sufficient to pay the cost for the coming fiscal year. Alternatively the County may conduct a mid-year supplemental billing for the pro-rated amount. Kent County shall enter into an agreement with the Kent Conservation District for the completion of routine maintenance, capital improvements, and emergency repairs within the stormwater maintenance district(s). Upon the mutual agreement of the Kent Conservation District and the County, either entity may enter into a contract with any private entity or entities to complete maintenance or improvement projects within the stormwater maintenance district(s). Such contracts may encompass work within an individual subdivision or land development or a group of subdivisions or land developments. All routine maintenance activities assumed by the district shall be contracted out to qualified private sector professionals. The Stormwater Maintenance District Technical Advisory Committee shall be appointed by the Levy Court to assist in the review and prioritization of capital projects, the annual budget, and general administration of the stormwater maintenance district program. The Committee shall meet a minimum of semiannually and be comprised of one staff member each of the Kent County Departments of Public Works, Planning Services, and Finance, three private-sector engineers, two representatives from the Kent Conservation District, one representative from the Delaware Department of Natural Resources and Environmental Control, a representative from a private stormwater maintenance company, and a citizen representative. The annual budget adopted by the Levy Court shall include a capital budget for significant repairs to and reconstruction of stormwater infrastructure within the district(s) and separate line items used for maintenance, administrative costs, and emergency repairs/reconstruction. Specific capital projects shall be recommended by staff and the Kent Conservation District for review and approval by the Levy Court. To the extent possible, specific projects shall be described in the annual capital budget.